Why is My Clown Loach Fish Smaller and Less Active than the Others? Home > Ask Our Experts > Why is My Clown Loach Fish Smaller and Less Active than the Others? I'm worried about my fish. I have 3 clown loach and 2 of them are fine but the 3rd seems poorly. I've had them for about 3 weeks, he seems very thin, a lot smaller than the others, I don't think he's eating and he also tips over and just lays there he seems to have trouble staying upright. Do you have any ideas? Don't worry about your loach being small. It's often the case that some loaches stay a lot smaller than others, and they can still live long and healthy lives like this. Loaches are very sociable fish and they will generally be just as friendly to a smaller companion. Unfortunately, loach friendliness tends to be forgotten when there's food around, as they can be quite single-minded when they're hungry. It's possible that your larger loaches are eating so quickly, and charging about so much when they do so, that the little one can't get close and doesn't have the chance to get enough food. This kind of problem can spiral out of control as the unfortunate fish gets weaker. For this reason and because of his balance problems, I suggest that you give him a temporary period of isolation. Once your smaller loach has his own space in an isolation tank, you can start to help him. The first thing to do is to figure out why he's falling over. This could simply be a result of malnutrition or digestive problems, but it might also be caused by an internal bacterial infection. I recommend treatment with Melafix, which will act as an antibiotic and which also helps fish to heal and to put on weight. It should make him feel better and stimulate his appetite. Because it's a gentle treatment, you can use this even if you have to keep him in the main tank, though it's always better to treat ailing fish separately. Even when he's hungry, your loach may have difficulty getting to food, at least until he's feeling a bit stronger. 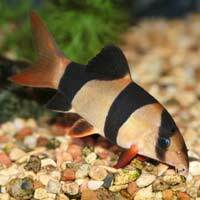 Since loaches are naturally friendly and tactile fish, he may be willing to take food from your hand. Be patient about helping him and look on this as an opportunity for the two of you to get to know each other better. If your loach has digestive problems, it may be that he can't cope with the diet you've been feeding him. Clown loaches should have plenty of vegetation in their diet. Some, however, have gluten allergies (like humans with Coeliac disease), which can lead to bloating and ill health. A lot of commercial aquarium foods have gluten in them. Try feeding him some boiled peas (with the skins removed) to help clear out his digestive system. If he recovers, watch him carefully in future to see if any foods have a negative effect on his health. If necessary, you can ask your local fish shop to supply you with appropriate gluten-free foods. Many fish do make it through health problems like these with sufficient care and attention from their owners. He may be struggling, but as long as he's making an effort and showing an interest in life, it's well worth trying to save him.